I was once a 14-year-old girl. I remember it pretty well – completely changing my appearance, pointless friend drama and New Found Glory. Pop-punk was perfect at the time, at it’s peak, and I was the perfect age for it. It was simple, it was exciting and it sang about all the same dumb stuff I felt and thought. 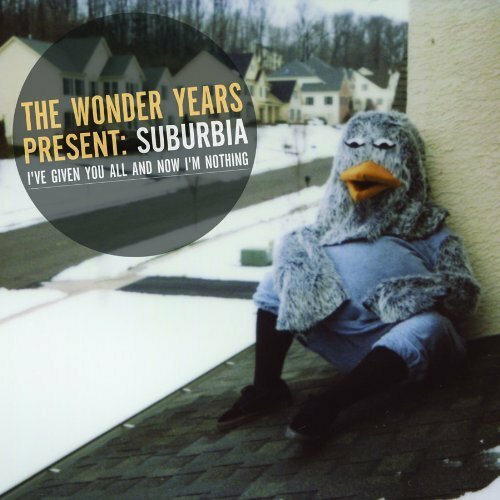 Sitting at my office desk job as an adult and listening to The Wonder Years – Suburbia I’ve Given You All and Now I’m Nothing is, at first, an odd experience. It brings up a weird mix of nostalgia and slight sense of awkward “I’m too old to still be doing this.” The feeling fades fast, though, as the album proves itself to have more substance than your standard girls-and-heartbreak fare. Suburbia I’ve Given You All and Now I’m Nothing is set up like a book. It tells the story of The Wonder Years’ first year as a full-time touring band. Opening track Came Out Swinging, rather aptly-named considering its aggressive nature, serves as a “prelude,” according to lead singer Dan “Soupy” Campbell; it quickly recounts what-all went on between 2010 release The Upsides and this one. From there, the story begins. The songs deal with anxiety, displacement and questions. In “Woke Up Older,” Campbell’s moved from his now-ex girlfriend’s apartment, thus no longer necessarily making Philadelphia his home, though later in “Don’t Let Me Cave In” he realizes there’s nowhere else that’d work out for him (though he ties it with Chicago), and “Hoodie Weather” regards everyone else’s will to leave the city they’re in. Alternately, “Coffee Eyes” is about belonging and having a place to return. “I Won’t Say The Lord’s Prayer” is somewhat of a rarity in the genre: where most would avoid religion unless they were practicing, The Wonder Years express very clear anti-Christian views. Interspersed through the timeline are the three tracks that make up the title – “Suburbia,” “I’ve Given You All” and “And Now I’m Nothing.” They act as three parts of a cohesive song, detailing the band’s hometown in Pennsylvania. “Suburbia” is a short description of how run down everything is and “I’ve Given You All” about a murdered man and alcoholics. “And Now I’m Nothing,” the final part of the series and final track of the album, is the perfect finisher – Campbell stays in Philadelphia and has an apartment and is working on songs, more okay than he was a year ago and in a better place overall. Suburbia I’ve Given You All and Now I’m Nothing is a good album. Like the best kinds of kids cartoons, it speaks to multiple age groups – the classic pop-punk sound conjuring images of confused teenagers pushing and shouting and singing and reaching for the stage at a crowded show, but the lyrics relatable to people of any age.